A recipe for citrus cocktail mini bundt cakes, cupcakes, or a full-sized bundt cake. A blend of four citrus fruit juices and zest plus a touch of citrus flavored liqueur are in the recipe. Preheat the oven to 350 degrees F. Grease and flour two mini bundt cake pans - or - one mini bundt cake pan plus a 12-cup muffin pan (or line with cupcake liners) - or - one 12-cup bundt cake pan. In a large bowl, beat butter and sugar using an electric mixer on medium-high speed until light and fluffy, about 5 minutes. Add the eggs, one at a time, beating well after each addition. Add the citrus zest, citrus cocktail mix, and liqueur. Beat until combined. Add the flour mixture in three additions, alternatively with the yogurt in two additions, mixing on low speed until just combined. Do not over mix. Stir in the vanilla. Fill mini-bundt pans and/or muffin pan 2/3 full with batter. Add all the batter to a 12-cup bundt pan (if using). 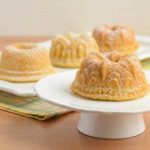 Bake until a toothpick inserted in the center of the cake comes out clean, about 15 to 20 minutes for mini bundts or cupcakes or 1 hour for a full-sized bundt cake. Cool mini bundts or cupcakes in the pan 5 minutes then remove them from the pan and cool on a wire rack. Cool a full-sized bundt cake in the pan for 15 minutes prior to removing the cake from the pan. Dust cakes with confectioners sugar or drizzle with citrus glaze. In a small bowl, stir in the citrus cocktail mix one tablespoon at a time until it has reached desired consistency. A recipe for citrus cocktail mini bundt cakes, cup cakes, or a full-sized bundt cake. A blend of four citrus fruit juices and zest plus a touch of citrus flavored liqueur are in the recipe.